adjustment was made for St. Croix, which was closer. Although the captain doubted the accuracy of the fuel gauge reading, he decided to descend in order to establish visual contact with the water. He also advised the purser that they were low on fuel, and to prepare the cabin for ditching. The purser made this announcement, and no other warning was given to the passengers prior to impact. The ditching site was confirmed on radar with the assistance of a PanAm flight that diverted for that purpose. Other fixed-wing aircraft orbited the area until the US Coast Guard, Navy, and Marine Corps helicopters began picking up survivors. Weather in the area during the rescue operation was estimated to be 400 to 500 feet overcast and visibility as low as three-eighths of a mile in rain. The aircraft sank in water more than 5,000 feet deep, and was not recovered. PROBABLE CAUSE: "The Board determines that the probable cause of this accident was fuel exhaustion which resulted from continued, unsuccessful attempts to land at St. Maarten until insufficient fuel remained to reach an alternate airport. A contributing factor was the reduced visibility in the approach zone because of rain showers, a condition not reported to the flight. 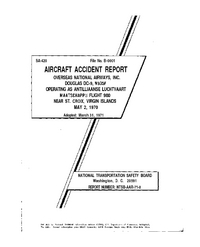 The Board also finds that the probability of survival would have been increased substantially in this accident if there had been better crew coordination prior to and during the ditching." Distance from New York-John F. Kennedy International Airport, NY to Sint Maarten-Juliana Airport as the crow flies is 2694 km (1684 miles).